I set the alarm this morning in order to see our arrival in Suva. It brought back memories of sailing the SV Sequoia through the same channel in 2004, when I crewed the open ocean segment from New Zealand to Fiji with the Johnstons. This time my mode of transportation is a bit more luxurious! Our arrival at King’s Wharf is heralded by the Suva Police Band – they march up and down the wharf playing some very catchy tunes. It is overcast today, so it is not as hot as Pago Pago was (our previous port of call in American Samoa). I call my Fijian friends several times this morning, but there is no answer, so I find my onboard friends and we go ashore together. We walk along the waterfront to catch some views of the harbour. 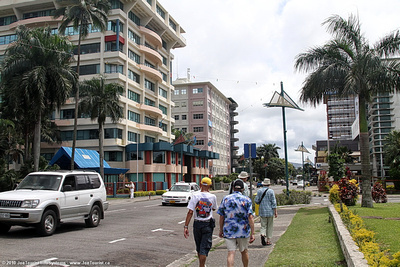 It is Independence Day in Fiji, so most shops and offices are closed. We meet several Fijian families who are enjoying the day off. We walk past the derelict Grand Pacific Hotel and take an obligatory photo of the guard dressed in a ceremonial uniform (including a sulu) who is posted at the Governor General’s mansion. We then wander through Thurston Gardens and see the Fiji Museum. The last time I toured this museum was in 1975. At that time, cannibalism artifacts were prominently displayed, but there wasn’t a sign of them during this visit. When I pay for the admission to the museum for myself and my friends, the guy at the desk notices my “old” bills. I had saved them from my last trip six years ago, so I guess they have updated their currency since then. Despite the cloudy weather, we still find the walk to be hot and exhausting. We stop in town to poke around the few shops that are open. A friendly Fijian “sweeper” directs us to the shops that sell t-shirts, jewellery, and other tourist stuff. I buy a Fiji Bitter beer t-shirt for FJ$22 (CD$12). We also walk through Prouds, a high end department store, but buy nothing. After returning to the comfort of the ship, I head for the Sea View pool to cool off, and then grab some lunch in the Lido. The Suva Police Band is once again there to serenade us before our 5pm departure. They have an incredible repertoire…not just marching tunes, but also pop and rock and roll! Their performance has to be one of the highlights of this trip. What a change from the last time I saw the band in 1975, when it was a pretty ordinary marching band. I shoot some high definition video to capture some of their wonderful performance. The ship was waiting in Suva harbour for the arrival of New Zealand customs and immigration officers. They were delayed about two hours…so we waited, and the band played on (as the old saying goes). What a show – this is no ordinary marching band! Fiji 2010 from JoeTourist InfoSystems on Vimeo. This entry was posted in Fiji and tagged gardens, island, marching band, museum, music. Bookmark the permalink.